Father John Misty has shared another new video from his excellent new album, God’s Favorite Customer. The new clip for “Date Night,” directed by labelmate Chad Van Gaalen, is a weird animated clip that’s a pretty surreal acid trip from beginning to end. 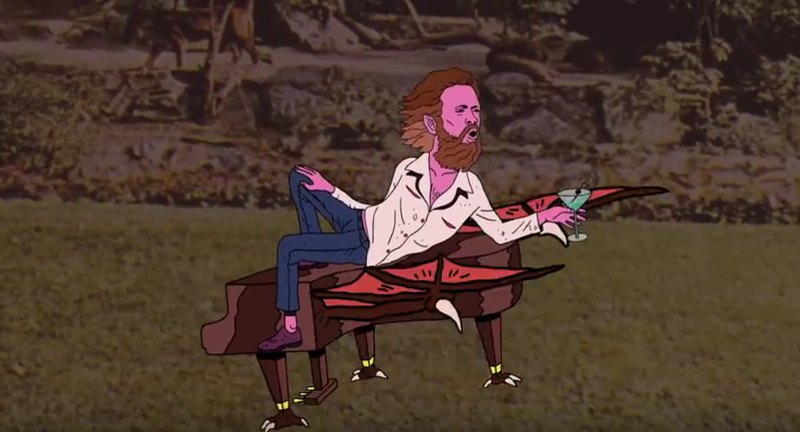 Among the peculiar sights throughout the video are a singing moon (with Josh Tillman’s lips), an astronaut with a cell phone, weird figures with winged ankles, an alien being harrassed by giant leeches, a smoking guy in an ice-cream cone costume, plus Tillman himself drinking a martini on a piano with bat wings. It’s pretty bonkers as far as videos go, but for some reason it seems to fit the image Tillman’s already cultivated for himself (and it still might not be as weird as his video for “Total Entertainment Forever“). Watch the clip below. Father John Misty’s God’s Favorite Customer is on our list of the 31 Best Albums of 2018 So Far. The California psych band finds their definition of “psychedelic” evolving with their best set of songs yet.